Influenza, or flu, is a respiratory illness caused by a virus. Flu is highly contagious and quickly spreads through via the coughs and sneezes of an infected person. 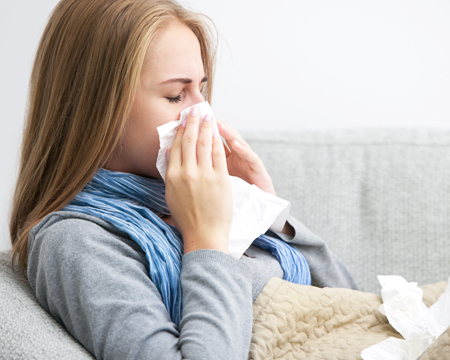 Flu appears most frequently in winter and early spring. The flu virus attacks the body propagating through the upper and/or lower respiratory tract. What's the difference between a cold and flu? The common cold and flu are both contagious viral infections of the respiratory tract. Although the symptoms can be similar, flu is much worse. A cold may drag you down a bit, but the flu can make you shudder at the very thought of getting out of bed. Flu is common throughout the world. The flu season lasts from October through May in the Northern Hemisphere and from April through September in the Southern Hemisphere. In tropical countries, flu can be spread all year-round. How can travelers avoid the flu? Annual flu vaccination is highly recommended in protecting one against flu viruses. A flu vaccine protects against the three most common disease causing viruses. Kids above the age of 6 months should get a flu vaccine as soon as the current season’s vaccines are available. A flu vaccination is available as either a shot or a nasal spray. Vaccination of high risk people decreases their risk of severe flu illness. If you get sick with flu-like illness, it is recommended to stay home for at least 24 hours until the fever is gone except to get medical care or for other necessities. The fever should subside without the use of an anti-pyretic (fever reducing) medicine. While sick, avoid or limit contact with others as far as possible to avoid passing on the infection. Cover completely your nose and mouth with a napkin when you cough or sneeze. Get a flu vaccination at Herbert & Shrive pharmacy in Teddington.